If you’ve taken a peek at websites like My Subscription Addiction or the Cratejoy Subscription Box Marketplace, you’ve seen just how many subscription boxes there are. And why not?! Subscription boxes are simply amazing, and my favorites are those subscription boxes for moms especially. 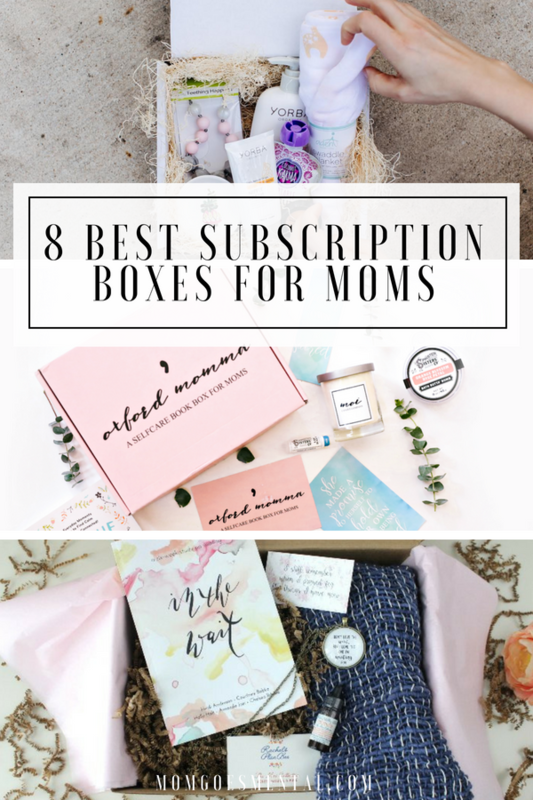 Whether you’re searching for a gift for mom or just looking to treat yourself every month, this list of the best subscription boxes for moms has something for you. Many of these I either subscribe to myself or have reviewed in the past. For those, I’ve linked to where you can read my reviews. Alright, so I admit that I may be biased because I curate each box, but I do believe Oxford Momma is one of the best subscription boxes for moms out there. Each box focuses on self-care from a whole self perspective. Like the Oxford (or serial) Comma, each box contains a book and three or more items just for moms. Check out the latest unboxings here! Delivering a monthly box of snacks and treats, this subscription box is created with the tired, the exhausted, the overwhelmed, and the just getting by mom in mind. Each Mother Snacker box includes 5-7 artisanal treats (full-size) and gifts for moms. I started Mother Snacker because I see you. I see you giving your all to your family and needing a little something for yourself but not knowing where to start. I see you crying on the bathroom floor wondering if you are even cut out for Motherhood. Well yes Mama, yes you are. Look for Mother Snacker reviews soon! Created by a Doula and Childbirth Educator, Pax & Lux caters to women going through pregnancy, birth, and the first few months of parenthood. Included are skincare, wellness, and mindfulness items and exercises designed to tend to the physical and emotional needs of moms and their families during a childbearing year. A monthly lifestyle subscription box for new and expectant moms, Mama Bird Box is an ideal way to pamper yourself. Each box includes 4-6 different items for mom and baby. Items may include things like organic skincare, healthy snacks, home accessories, and more. Decidedly the most touching of all the subscription boxes for moms, HeartGrown is a beautiful monthly box for adoptive mothers. This inspirational monthly subscription is truly a gift for moms enduring the often long and hard wait for their child to join their family. Each box includes 2-3 adoption themed items and a self-care item just for mom. Like most parents, deciding which products are the best for me and my baby has always been a challenge. Bayside Baby seeks to make that a little easier by sending new products that are tried and true. Each monthly subscription box features five or more full-size products. These could be skincare, accessories, apparel, or toys—anything that makes mom life easier. You can also customize your box to baby’s age—very cool! Ecocentric Mom is one of those subscription boxes for moms that really speaks to me. Curated with the mindful, modern mom in mind, each monthly box includes full and deluxe size beauty and wellness items for moms and additional items for either bump or baby. Look for Ecocentric Mom reviews soon! Mommy Mailbox (along with its sister box, Miss Mailbox) aims to reward and uplift women every month. Delivered monthly, every box includes 4-6 items for your self, home, or lifestyle. These include anything from makeup and beauty products to jewelry and treats or stationary. Read my Mommy Mailbox reviews here! Please take a look at [link removed] It’s the perfect gift for senior mothers and grandmas. Hi Andy, thanks so much for checking out my article! As my blog is a source of income for my family, I do ask that all promotions be approved before appearing on my blog, so the link in your comment was removed. This allows me to decide whether a product is better promoted as a complimentary service, paid editorial, or as an affiliate product. Thank you so much for your understanding! Feel free to get in touch if you’re looking to promote your own company, subscription box, or brand. I’m always happy to showcase these to my readers!